LitReactor is an interactive online community where writers improve their craft and readers celebrate their love for literature. An online magazine packed with news and columns about writing craft, the publishing industry, books, and other literature-related items. A writing workshop, open to all genres and skill levels, with a groundbreaking peer-review system. Online writing classes on a variety of subjects, taught by established authors and industry professionals. A robust, online discussion forum covering an unfathomable array of subjects. Community-wide writing competitions, replete with prizes (and bragging rights). Since launching in 2011, LitReactor has been featured in The Huffington Post, Lifehacker, The Daily What, and The Writer magazine. 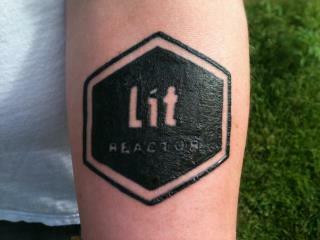 Members have provided each other with support and encouragement, scheduled meet-ups, organized writing anthologies, and even tattooed themselves with the LitReactor logo. If you’re passionate about reading and/or writing, this is the only website you ever need to visit for the rest of your life. "LitReactor has built a community of writers who gain confidence from one another’s victories and learn from each other’s mistakes. In LitReactor’s programs, students get access to the skills and experience of brilliant, professional storytellers. A dedicated student who pays attention will flourish. This is the boot camp of writing. LitReactor is all the coaching you need." "I've been impressed with LitReactor, and even more impressed with the messages that have come in via Twitter and Facebook from people who wanted to write better and have signed up to learn things through this site." "Creative writing is both natural and a skill set. The more you do the better you get. Think of it like shagging, and LitReactor as a bedroom." So are you a member yet? If not, why not?! Click here for a tour, and to create an account.